An exciting safari experience exploring the diversity of the lesser travelled South Eastern African countries. This tour is not for the faint hearted, and requires some patience; the travelling can be slow, some nights the accommodation is basic, however the journey offers amazing scenery and fantastic highlights, well worth the long travel days. We recommend malaria prophylactics. 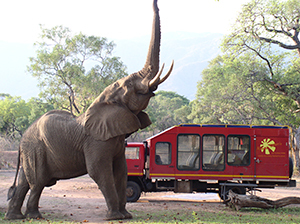 A safari for travellers with a sense of adventure. Departs: LIVINGSTONE on Saturday at 14:00pm. Ends: JOHANNESBURG on Saturday at 18:00pm. 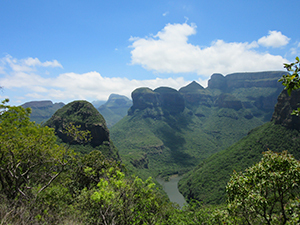 • A diverse African adventure – discovery route. •	All inclusive trip with cultural experience, adventure and wildlife through Zambia, Malawi, Mozambique and South Africa! 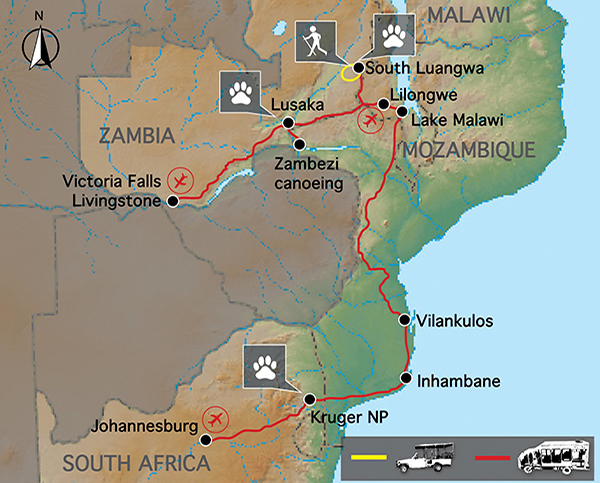 •	Vic Falls, Lower Zambezi canoeing, Lake Malawi, Benguerra Island, Kruger National Park – great diversity! • 21 nights on safari we stay at chalets, tented lodges and guest houses, of which; 15 nights en suite facilities. • 1 night camping (tents, mats, chairs, sleeping bag and pillow will be provided). 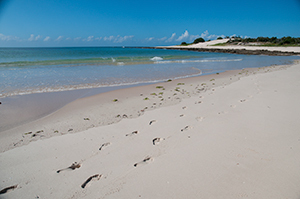 • 5 nights in chalets with shared ablution facilities in Cape Maclear, Bilenes and Kruger. The accommodation can be rustic or even basic, these may be the only option. • 20 breakfasts, 20 lunches and 17 dinners are included, of which; 7 breakfasts & 3 dinners are provided by the lodges. • The remaining included meals are prepared by the safari crew, prepared at the vehicle and enjoyed around the campfire or at the truck. 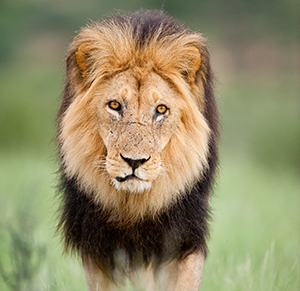 SAFARI COST: $3,345 per person sharing, plus local payment of US$400 (in cash). The group will meet in Livingstone, in Zambia, at 14:00. 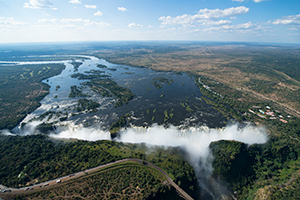 This afternoon we explore Victoria Falls, a natural wonder of the world, plunging into the Zambezi Gorge. Includes: Entrance to see the Victoria Falls. Day 1: Breakfast is not included. Day 1: Lunch will be an own expense meal. Day 1: Dinner will be an own expense meal at a local restaurant. Overnight: Maramba River Lodge Safari Tents – twin share en-suite safari tents. Swimming pool, restaurant & bar. WIFI not available. A long drive takes us across the rolling Miombo forested hills of southern Zambia and down into the lowlands and our lodge on the banks of the Kafue River. Includes: Day 2: Breakfast will be provided by the lodge. Day 2: Lunch provided by the tour leaders with the help of the group. Day 2: Dinner provided by the tour leaders with the help of the group. Overnight: Gwabi River Lodge – Twin en-suite rooms. Swimming pool & bar. WIFI not available. Distance / Time: 505 kms, ± 8 hours, excludes stops for sightseeing & lunch. 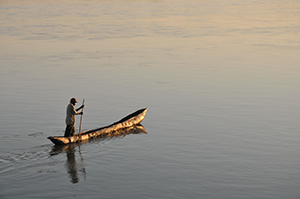 We paddle down the mighty Zambezi River, home of the tribal mythical god – Nyami Nyami. Canoeing past local riverside villages and magnificent scenery. 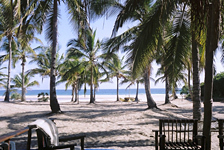 We overnight in wild campsite on Elephant Bones Island in the heart of untamed Africa. The following morning we continue our canoe safari through an area teaming with elephants, hippos and other wildlife. We will be collected by a motorboat, and are transferred back up river to our lodge. 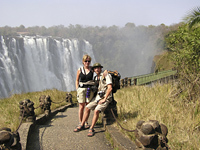 Includes: Full day canoe safari on Lower Zambezi with local river guides. Day 3: Breakfast will be provided by the lodge. Day 3: Lunch provided by the tour leaders with the help of the group. Day 3: Dinner provided by the tour leaders with the help of the group. Day 4: Breakfast provide by the tour leaders with the help of the group. Day 4: Lunch provided by the tour leaders with the help of the group. Day 4: Dinner provided by the tour leaders with the help of the group. Overnight Day 3: Wild Camping – we camp wild on an island in the Zambezi River. for 1night while canoeing on the Zambezi River we camp wild on an island in the middle of the river. Wild camps have no facilities; we will need to take our own water and all equipment. Wild camping can be very enjoyable but please remember that we leave no trace of our stay and take all rubbish away with us. Toilets will be of the “dig and bury” variety. All the camping equipment is supplied with the exception of your sleeping bag and pillow. The dome tents we use are 2.2 x 2.2 x 1.8 metres and putting them up or down takes only 5 minutes. Tents have built-in insect nets. We supply mattresses, which are about 5 cm thick, warm and comfortable. The camp chairs have a backrest. WIFI not available. Overnight Day 4: Gwabi River Lodge – Twin en-suite rooms. Swimming pool & bar. WIFI not available. Distance / Time: 50kms, ± 1½ hours (subject to road conditions), excludes stops for sightseeing & lunch . A leisurely start to the day before we head to Lusaka where we stock up on supplies in the bustling shops and markets of the Zambian capital. Includes: Day 5: Breakfast will be provided by the lodge. Day 5: Lunch provided by the tour leaders with the help of the group. Day 5: Dinner will be an own expense meal at a local restaurant. Overnight: Eureka Camp – Twin en-suite rooms. Swimming pool & bar WIFI not available. Distance / Time: 160kms, ± 6½ hours (subject to road conditions), excludes stops for sightseeing & lunch . Today is a transit drive, as we travel along the “great east road” across the Luangwa River Bridge and to the town of Nyimba. 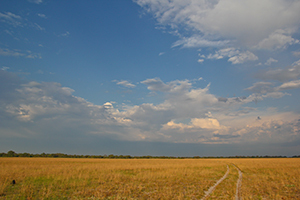 Villages line the road at intervals and there is an opportunity to witness the rural Zambia lifestyle. Includes: Day 6: Breakfast will be provided by the lodge. Day 6: Lunch provided by the tour leaders with the help of the group. Day 6: Dinner provided by the tour leaders with the help of the group. Overnight: Taitana Lodge – Twin en-suite rooms. WIFI not available. Distance / Time: 350kms, ± 5 hours (subject to road conditions), excludes stops for sightseeing & lunch . South Luangwa is well known for its large concentration of wildlife along the river, boasting huge numbers of hippos, crocodile and elephants. We explore the diversity of habitats including woodlands, grass plains and riverine forest on open vehicle game drives as well as on foot on exciting game walks. 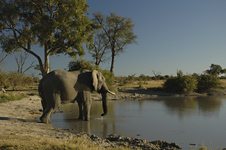 From the comfort of our tented lodge we often see elephants crossing the river at sunset. (In the green season, Dec – Apr, walks may not be possible in which case we’ll do extra game drives). 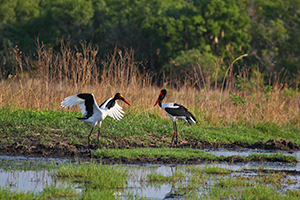 Include: Entrance fees to South Luangwa National Park, 2 x game walks, 1 x game drives. Day 7, 8: Breakfast will be provided by the tour leaders with the help of the group. Day 7, 8: Lunch provided by the tour leaders with the help of the group. Day 7, 8: Dinner provided by the tour leaders with the help of the group. Overnight: Wildlife Meru Tents swimming pool, restaurant & bar. WIFI not available. Distance / Time: 230kms, ± 3 hours (subject to road conditions), excludes stops for sightseeing & lunch. Optional Activities: Game walks & game drives. We cross into Malawi and make our way to the Capital Lilongwe where we settle into our chalets. In the afternoon we explore the craft markets with their beautiful wooden carvings, woven baskets and traditional wooden chairs. Includes: Day 9: Breakfast provide by the tour leaders with the help of the group. Day 9: Lunch provided by the tour leaders with the help of the group. Day 9: Dinner provided by the tour leaders with the help of the group. Overnight: Annies Lodge – Twin share en-suite rooms. Swimming pool, bar & restaurant. WIFI available. Distance / Time: 380kms, ± 6½ hours (subject to road conditions), excludes stops for sightseeing & lunch. 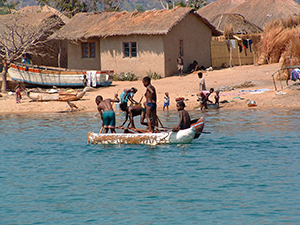 We make our way to Lake Malawi to our lodge on the lake shores. From here we will discover the lake’s islands on a boat trip and snorkel with the jewelled fish, the Cichlids. 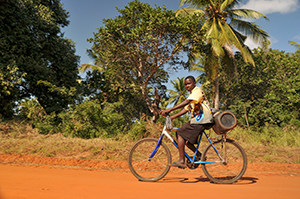 The friendly people of Malawi make it the “warm heart of Africa”. Includes: Island boat excursion. Day 10: Breakfast will be provided by the lodge. Day 10: Lunch provided by the tour leaders with the help of the group. Day 10: Dinner will be a set meal provided by the lodge. Day 11: Breakfast will be provided by the lodge. Day 11: Lunch provided by the tour leaders with the help of the group. Day 11: Dinner will be a set meal provided by the lodge. Overnight: The Funky Cichlid – twin share rooms with shared ablution facilities, & hot showers. Distance / Time: 285kms, ± 4 hours (subject to road conditions), excluding border formalities & stops for sightseeing. We journey south and enter Mozambique. For the next two days we cross this magnificent country passing traditional villages and farm lands as we make our way to the warm waters of the Indian ocean. Includes: Day 12: Breakfast will be provided by the lodge. Day 12: Lunch provided by the tour leaders with the help of the group. Day 12: Dinner provided by the tour leaders with the help of the group. Day 13: Breakfast will be provided by the tour leaders with the help of the group. Day 13: Lunch provided by the tour leaders with the help of the group. Day 13: Dinner provided by the tour leaders with the help of the group. Overnight Day 12: Mulamba Hotel – Twin share en-suite rooms. Overnight Day 13: Casa Msika – twin share en-suite rooms . Distance / Time: 450kms ± 6-7 hours per day (subject to road conditions), excludes stops for sightseeing & lunch. Tropical paradise and golden beaches, we spend the next two nights in Vilankulos, where we take a full day trip on a traditional Arab Dhow to the beautiful island of Magaruque. The guides will prepare a picnic lunch under the palm trees while you snorkel with the colourful tropical fish. This is a definite highlight of the safari. 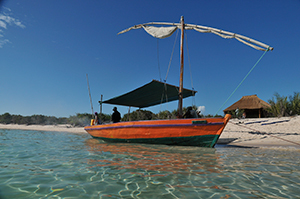 Includes: Full day Dhow excursion to Bazaruto Islands. Day 14: Breakfast will be provided by the tour leaders with the help of the group. Day 14: Lunch provided by the tour leaders with the help of the group. Day 14: Dinner provided by the tour leaders with the help of the group. Day 15: Breakfast will be provided by the tour leaders with the help of the group. Day 15: Lunch provided by the tour leaders with the help of the group. Day 15: Dinner will be an own expense meal at a local restaurant. Overnight: Golden Sands – for 2 nights in Vilankulos we stay in twin en-suite rooms. Swimming pool, bar, restaurant, telephone. Wifi not available. Distance / Time: 530kms ± 6 hours (subject to road conditions), excludes stops for sightseeing & lunch. Historically Inhambane was a centre of trade dating back hundreds of years where slaves were traded alongside spices and gold. We explore the town before we head to the beach and our casitas under the palm trees. Seafood, sun and surf, we have the following day to relax on the beach or cross the bay to Maxixe on an Arab Dhow. Scuba diving, snorkeling and deep sea fishing are available (own expense). Includes: Day 16: Breakfast will be provided by the tour leaders with the help of the group. Day 16: Lunch provided by the tour leaders with the help of the group. Day 16: Dinner provided by the tour leaders with the help of the group. Day 17: Breakfast will be provided by the tour leaders with the help of the group. Day 17: Lunch provided by the tour leaders with the help of the group. Day 17: Dinner will be an own expense meal at a local restaurant. Overnight Maun: Island Safari Lodge – standard twin rooms with en suite facilities. Swimming pool, bar, restaurant, telephone. WiFi not available. Overnight: Palm Grove Resort – Twin share en-suite rooms. Bar, restaurant, telephone. Wifi not available. Distance / Time: 330kms, ± 4½ hours, excludes stops for sightseeing & lunch. Optional Activities: Scuba diving, ocean safari & deep sea fishing. A large lagoon near the costal town of Bilene is our next stop offers clear water and white beaches. We spend the afternoon exploring the lagoon, and swimming in the shallow, calm waters. Includes: Day 18: Breakfast will be provided by the tour leaders with the help of the group. Day 18: Lunch provided by the tour leaders with the help of the group. Day 18: Dinner own expense. Overnight: Laguna Camp – Twin share Casitas with good shared ablution facilities, hot showers, swimming pool, restaurant, bar & shop. Optional Activities: Kayaking, snorkelling, & other water sports. Kruger National Park is famous for its variety of wildlife. We cross the rugged wilderness of the Transfrontier Limpopo Park and enter the national park and head to our camp. We spend our time on game drives which offer pristine wildlife and we hope to spot the shy leopard, lion, zebra and elephant over the next two days. Includes: Entrance fees to Kruger National Park, morning and afternoon game drives. Day 19, 20: Breakfast will be provided by the tour leaders with the help of the group. Day 19, 20: Lunch provided by the tour leaders with the help of the group. Day 19, 20: Dinner provided by the tour leaders with the help of the group. Overnight: Kruger Tented Camp – Twin share tented camp with good shared ablution facilities, hot showers, swimming pool, restaurant, bar & shop. 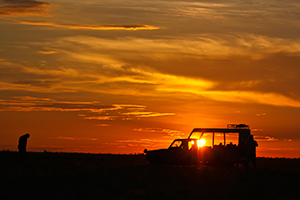 Optional Activities: Night game drive in National Park game viewing vehicles. The Panorama Routes’ wide open vista is the final stop on our magnificent journey. An area of mountains, escarpments, streams and forests. We explore Bourkes Luck Potholes, God’s Window and the Three Sisters. The tour finishes in Johannesburg in the afternoon of day 22, having had the experience of a lifetime. Includes: Early morning game drive. Day 21: Breakfast will be provided by the tour leaders with the help of the group. Day 21: Lunch provided by the tour leaders with the help of the group. Day 21: Dinner will be set menu provided by the lodge. Day 22: Breakfast will be provided by the tour leaders with the help of the group. Day 22: Lunch will be an own expense meal. Overnight: Graskop Mogodi Lodge – for 1 night we stay in twin share bedrooms ensuite, for a chance to tidy up before flying out on day 22. Swimming pool, bar, restaurant, telephone. Wifi not available. Distance / Time: 480kms, 6½ hours excluding stops for sightseeing, lunch & game drives. Note: The distance and travel times quoted above are an estimate only, and subject to local road conditions – remember it’s an adventure! Note: That the accommodation specified above and in the itinerary, is a guide only and is subject to availability. Alternatives will be of a similar standard, and accommodation changes will be made without notice. 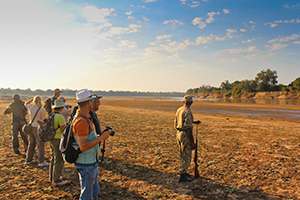 Special Interest: A walking safari in South Luangwa is an essential Zambian experience. Game scouts will lead us on an exhilarating walk in this big game wilderness. Sustainable Tourism: In the Luangwa Valley we stay at Wildlife Camp who donate 60% of their revenues to the Wildlife and Environmental Conservation Society of Zambia. A local guide will lead us on a game walk and night drive. Your visit will support employment opportunities. Due to the sometimes demanding road conditions you travel in a custom safari truck with 12 seats. Potholes, speed bumps(!) & rain damaged gravel roads are characteristic of the areas we travel through and can make driving slow and bouncy. However, we pass through road side villages and thus have opportunity to witness the local lifestyle. 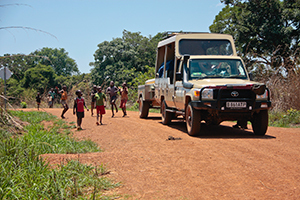 For the game drives in South Luangwa we use open sided 4WD vehicles with local guides. An essential part of your safari is participation – from helping around the camp fire, to packing away in the morning, to helping with cleaning up – it’s all part of your adventure and when everyone puts in a little effort the trip will run smoothly. Your tour leaders will do all the meal preparation but we do ask the clients to help with the washing up. Team spirit is part of the fun! •	Craft shopping for curios en route is diverse and rewarding. Remember - if you see something you like, it is best to buy it because it is unlikely that you will see something similar further along. •	Anyone who is generally active and in good health should enjoy this trip. Simple campsites are enjoyed by the outdoor enthusiast, you will get dusty on occasion; but this is Africa! •	This is a long distance trans Africa safari - there is a lot of distance to be covered and so there will be some long travelling days. Due to local conditions, border crossings, road detours and weather, the trip may alter route / schedule - please remember that this continent has its own time scale and things work differently here. Keep an open mind and a sense of humour - it’s all part of the adventure! •	Your will need a valid passport and visas for entry into Zambia, Malawi, Mozambique and South Africa. Please note that these can be arranged in advance and cannot always be obtained at the border. (Please check visa requirements with your travel agent). At the time of this update, a Mozambique visa is available at the border. •	Forex bureau’s are available in Livingstone, Lilongwe, Blantyre & Vilanculos. However we recommend that you bring small denomination Euro or US$ cash notes for personal expenses on this trip. In some cases you'll be able to pay local service providers in forex, and in some cases you'll need to change into the local currency (Zambian Kwacha, Malawian Kwacha, Mozambique Meticais and South African Rand). Zambia requires that all services are paid in local currency, however major credit cards (Mastercard / Visa) can also be used for optional activities in Livingstone and elsewhere on tour. • Is it safe? Africa and on the route we follow is relatively safe and your guide knows the countries intimately and will endeavour to show you the best parts while looking after you. We do not enter Zimbabwe on this trip. In the cities keep a careful eye on your belongings and don’t leave anything lying about - petty theft is rife. In the wild areas your guide will brief you on the necessary precautions, follow this advice and you will be fine. Be aware of your personal belongings and you will have a great trip.